San Francisco: From humble origins, Subaru has worked its way up to being a rather upscale and technically sophisticated line of automobiles. As the compact Impreza takes on new life as the WRX rally-inspired rocket and the B9 Tribeca pushes the brand into the luxury SUV crossover realm, the Legacy midsize sedan and wagon have grown up, too. 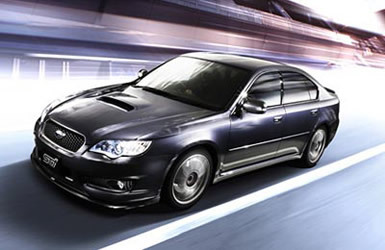 What was a sporty version of the top-of-the-line 2.5GT now becomes an entity of its own, sitting atop the Legacy hierarchy. Yes, the day of the 243-horsepower turbocharged Subaru is here. Of course, the spec.B puts that horsepower and 241 lb.-ft. of torque to the ground through all four wheels. Every Subaru is all-wheel-drive, and it’s a big selling point. Subaru calls it “symmetrical” because of the unique combination of its horizontally opposed “flat” boxer engine with full-time all-wheel drive. With all-wheel drive, if a wheel is slipping, the other ones pick up the slack, automatically. There are no levers to pull or buttons to push in a Subaru. While these cars are not made for the boulder-laden Rubicon Trail, they do just dandy at protecting you and yours in normal and dangerous road conditions, such as ice, sand, and snow. My tester arrived wearing classy Diamond Gray Metallic paint. Nothing to indicate wild speed there, but inside, the sporty leather bucket seats featured Dusk Blue Alcantara inserts, for a suede like feel. The Legacy’s overall appearance was modernized recently, and it is a handsome design, that is neither way out nor dated, just about right. It resembles in some ways its German competition, such as the BMW 3 Series and Audi A4. Surely, the resemblance is not unintentional. 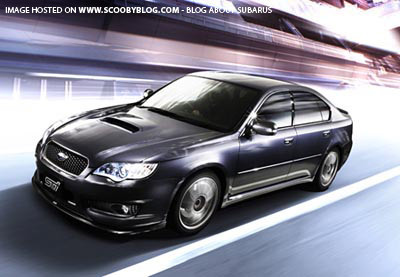 As a midsize sedan, the spec.B is a fine family vehicle, regardless of its hidden potential. The spec.B logos tip other motorists off that something might be going on with the car in front of them. You, rapidly disappearing into the distance, might also give them a clue. At the front end, the car’s eyes peer intently forward, like an Eagle in search of prey. The narrow grille looks ready to consume something if it gets the chance, perhaps a slow moving Camry. The clean sides wear ground effects moldings, and lead to a tall tail with built-in spoiler. Large tail lamps are flush-mounted into the concave back panel. All spec.B models come with 18-inch alloy wheels with Bridgestone performance tires. Hiding behind them is a special Bilstein Sport Suspension that makes carving up your favorite back road an effortless exercise. A major factor in making that drive fun is Subaru’s new SI-Drive technology (It stands for Subaru Intelligent Drive). This system lets you change the car’s driving characteristics into “Intelligent,” “Sport,” and “Sport Sharp” modes using a rotary dial on the center console. The system alters the settings in the car’s computer system for the engine and transmission control units. The goal is to configure the car’s performance to your driving style and requirements. Intelligent mode reduces engine torque and maximum power and gives the throttle response a gentler curve. This is ideal for tooling around town, and tends to improve fuel mileage. It’s also better if you are driving in slippery conditions, where you want to restrain power to avoid spinning your wheels. Sport mode delivers lightning fast throttle response and powerful acceleration. The Sport Sharp mode holds the gears longer and is ideal for driving on the twisties or passing other cars quickly. The six-speed manual transmission in the spec.B comes from the ultra-hot Impreza WRX STI. It’s a pleasure to shift your own gears in a car this size. So many midsize sedans offer you nothing but an automatic. This year, the spec.B also receives a stability control system called Vehicle Dynamics Control (VDC) and a TORSEN torque-sensing limited-slip differential. All of these electronic marvels make your trip down the road safer. Subaru adds plenty of passive safety too, in the form of airbags galore, antilock brakes (four-wheel ventilated discs), and even a tire pressure monitoring system. The spec.B gets the full complement of upscale car features, including power windows, locks and mirrors, dual zone climate control, heated front seats and mirrors, windshield de-icer, cruise control, steering wheel mounted audio controls, and more. It comes ready for XM Satellite Radio, and my car included it as one of only two options. With all of its many virtues and powers, the spec.B is not an inexpensive proposition. It’s $33,995.00, plus $625 destination charge. With satellite radio and wheel locks, my tester stickered at $35,118. If you want the looks but can do without the power and the glory, the Legacy 2.5i Special Edition starts at just $20,795, and models work their way up in approximately $4,000 increments to the spec.B.